Most people think the microprocessor is the most important component of a computer. 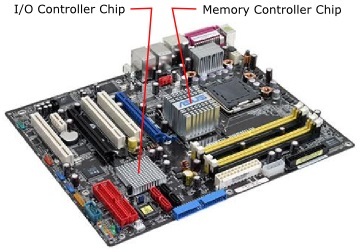 But modern processors do not directly control the computer's main memory or peripheral devices. They interface to them through a couple of special chips referred to simply as "the chipset". Because the chipset dictates the bus speed, type and amount of memory, and the type and number of I/O ports, much of a computer's performance is determined by its chipset. The chipset traditionally consists of a "northbridge" chip, which controls high-speed interfaces like main memory and video display, and a "southbridge" chip which controls lower-speed devices like disc drives and bus expansion slots. Lets explore a couple of common chipsets. 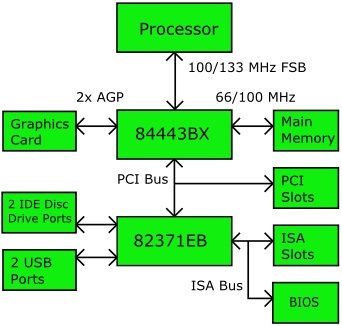 The Intel 440BX chipset, the block diagram for which is shown below, consists of the 82443BX North Bridge, and the 82371EB PCI to ISA Bridge. It was designed to support the Pentium II and Pentium III processor. The 82443BX was designed for the Pentium II and Pentium III processor with a 100/133 MHZ Front Side Bus, it features support for one AGP (Accelerated Graphics Port), up to 1 GB of DRAM memory, and a 33 MHz PCI Bus. It interfaces to the 82371EB PCI to ISA Bridge. The 82371EB (PIIX4E) PCI to ISA Bridge, in addition to providing an ISA bus, also provided a Dual-Channel Enhanced Integrated Device Electronics (IDE) Interface (Ultra DMA/33) which supports up to four IDE devices, 2 USB 1.0 ports, and support for a legacy keyboard and mouse. In 2000 Intel introduced a different architecture starting with the 820 which divides chipset functions between a Memory Controller Hub (MCH) chip and an I/O Controller Hub (ICH) chip. The picture above shows the location of the Intel 955X chipset, which consists of the 82955X MCH chip (covered by a cooling fan) and the Intel 82801GR ICH chip (covered by a cooling fan), on the Asus P5ND2 SLI motherboard.